Hello! Yesterday I was lucky enough to attend the River Island Spring/Summer 2016 Press Day to get a sneak peak at all the gorgeous pieces we can expect in stores soon. If you're into bold prints and bright colours or a neutral, more softer look, this season River Island have something for everyone. I've included lots of pictures in this post so you can all get a good look at what's to come, enjoy! As soon as I walked into the room I was instantly drawn to the rail of clothing shown directly above. While I love bright colours and prints for Spring/Summer, I really love this collection with its soft neutral colours, suede fabrics and lace detailing, it's just beautiful! There was one piece in particular that really caught my eye and that's this gorgeous grey suede jacket with fringe detailing. Above, I've picked out a few pieces that I'm really looking forward to seeing in stores. I particularly love the khaki dress with it's strong utility feel and the gorgeous golden beaded dress. I also love the beige suede heels as they have a gorgeous wrap around detail and the high waist nautical shorts. 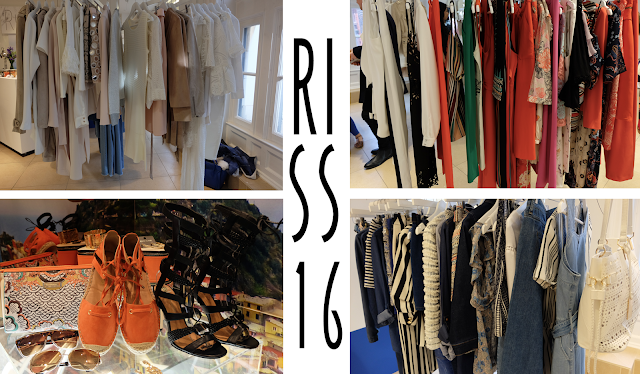 Did anything catch your eye in this post and are you as excited as I am to shop River Island's SS16 collection? Be sure to let me know in the comments and thank you so much for reading.